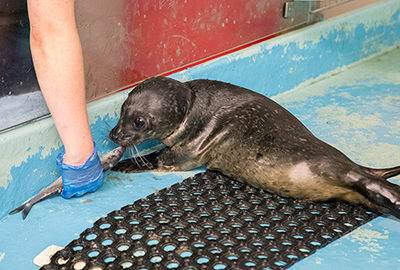 The first seal pup to arrive was Dumbo on 21st June 2017, sadly this healthy 1-2 weeks old male common seal pup was lifted off the beach by a member of the public and placed in a cardboard box and brought to the SEA LIFE Sanctuary. Click here to see a larger version of this photo of Dumbo. 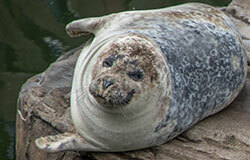 Norbert, one week old male common seal pup, was rescued from the Isle of Rum in the Inner Hebrides. He was found by a member of the public who had observed him for a day and mum was no where to be seen. Due to the somewhat inaccessible nature of the Island (ferries are very limited); it took a team of people to relay the pup to one of the vets in Fort William. Click here to see a larger version of this photo of Norbert. Here are some of Dumbo and Norbert´s get well soon messages, Click on the photo below to see a larger version. This photo of Norbert (left) and Dumbo (right) was taken on the 22nd August 2017. 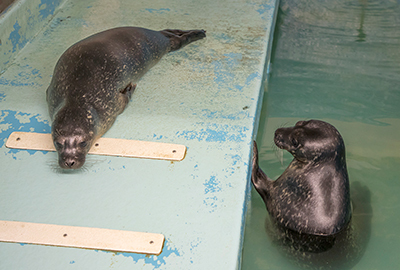 Dumbo and Norbert will remain in the hospital´s wean/swim pool for a few more weeks before they are moved outside to the resident seal pool for their final stage of rehabilitation. 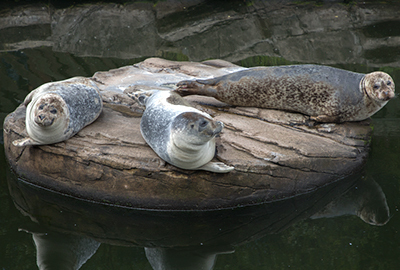 Macey, Pippa and Lora love nothing better then to lay around on a sunny day on their rock whilst Boo sits a distance away in the land, so she has more photos of her taken by the visitors. l-r: Macey, Pippa and Lora. Boo loves having her photo taken. An intesting fact about North American River Otters. Did you know that they can stay underwater for up to eight minutes and can close their ears and nostrils to keep water out. 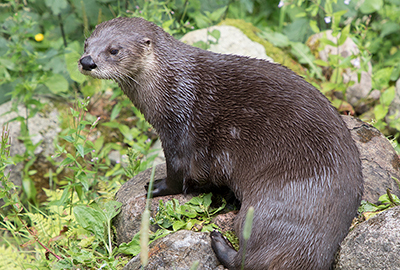 Otters can also dive to a depth of 60 feet! Please click here or on a photo of your choice, to see a larger version. 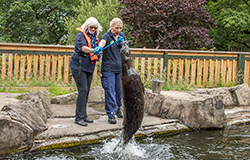 Click here for more details, the link will take you through to Merlin Entertainments´ official Scottish SEA LIFE Sanctuary website. 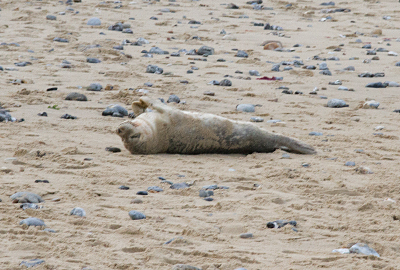 To avoid disappointment, please contact the Sanctuary direct on 01631 720386 prior to booking your Seal Experience to make sure there are places available. Remember Only two people per feeding session. 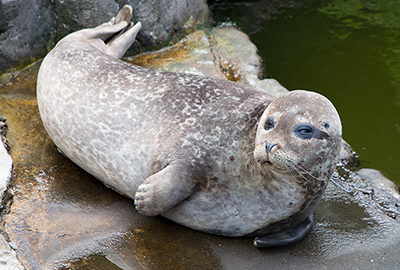 Cereal is so last year - vote FISH this breakfast time and join the resident seals on a unique experience that you´ll never forget! 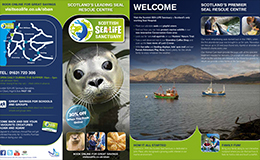 Leaving direct from the Scottish SEA LIFE Sanctuary, the Sea Explorer runs boat trips every Sunday, Monday, Wednesday and Friday to take in spectacular scenery and stunning wildlife until 1st September 2017. 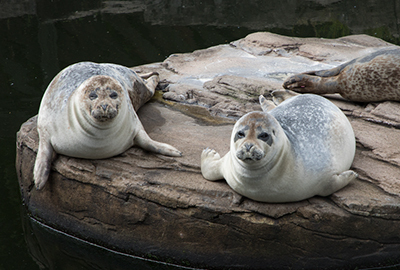 For just £22 per adult and £16 per child you will get entry to the Sanctuary plus a half hour (30 minutes) boat trip out to the local seal colony to see wild seals in their natural habitat! See if you can spot any pups! 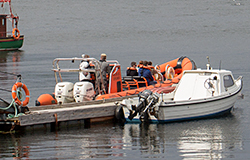 So why not click here to Book your boat trip. 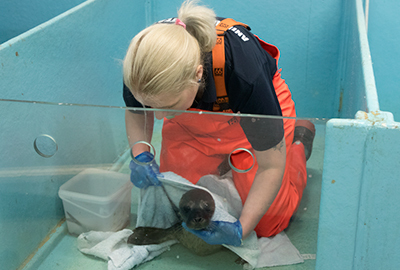 Help us to maintain first class animal care at SEA LIFE. Click here to download a printer friendly pdf version of the Sanctuary´s latest leaflet. During Spring & Summer the Sanctuary´s will be open from 10am until 5pm with last entry at 4pm. 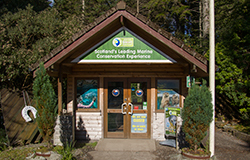 For Autumn/Winter opening times - please check before your visit.